Working for a business is not all one might hope it could be in many cases. Despite rhetoric about passion and engagement, many people do not enjoy going to work every day, and often dread having to do so. Research shows that this reality is the same whether a person works for a business, a government institution, a non profit or a school, or any other kind of organisation. A recent research from Gallup, for example, mentioned how the levels of engagement of employees are extremely low, particularly in larger companies. More and more people wish for a greater sense of purpose, and to be appreciated more for what they can do, rather than denigrated for what they cannot. Frederic Laloux is a Belgian author and a former McKinsey Consultant. He is the author of the book “Reinventing Organizations”, a book that became a phenomenon, and that discusses the emergence of a new management paradigm. The book resulted from two years of intense research about the functioning of all kinds of different types of organizations in the whole world. The book reviews twelve highly successful and effective businesses and organisations that Laloux encountered, during his research, These 12 organizations have been created and run over the last twenty years or so by a particular type of leaders. These companies, according to Laloux, are operating at or near the TEAL stage of consciousness. 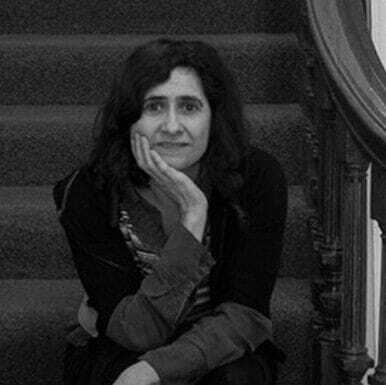 The TEAL stage of consciousness corresponds to the more advanced stages of psychological and spiritual development , as outlined in the works of Ken Wilber and other developmental thinkers such as Robert Kegan. 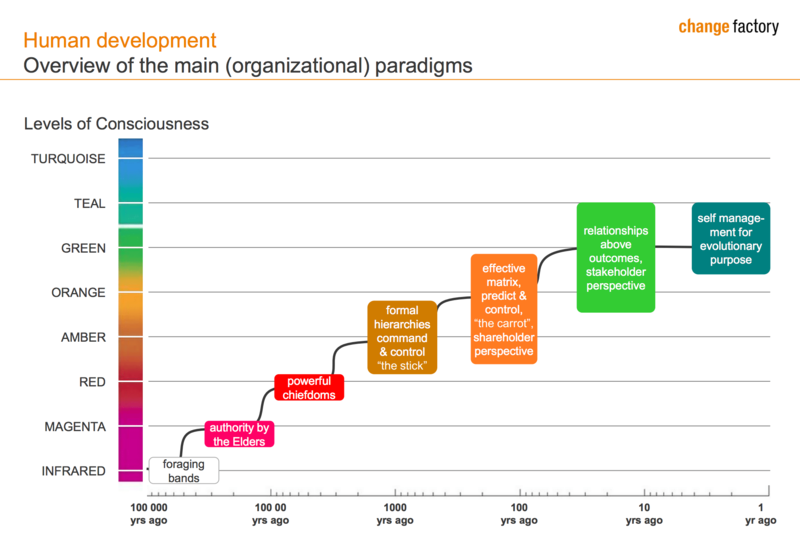 Laloux adopted the theoretical framework of this developmental thinkers to his study of companies, by using colours to identify different kinds of organisations. For example, “orange” are those organisations that have a goal of beating the competition, using innovation and a meritocracy. Meanwhile “green” organisations are those that use culture and empowerment to encourage greater employee motivation, aiming to manage stakeholders more effectively. As stated previously, the pioneering organisations referred to are those that are “teal”. These are organisations where self-management is used to replace a hierarchical pyramid. Organisations of this type are viewed as living organisms that have an evolutionary purpose and which focus on wholeness. An important part of Laloux analysis is on leadership. According to the authors, certain leaders are starting to work towards the stage beyond green, which is teal, in their leadership. They are leaders that have worked to leave behind their egos and are more interested in finding out what others have to say, to gain insight. They work to achieve a situation of mutual trust. They take decisions in a manner imbibed with integrity. 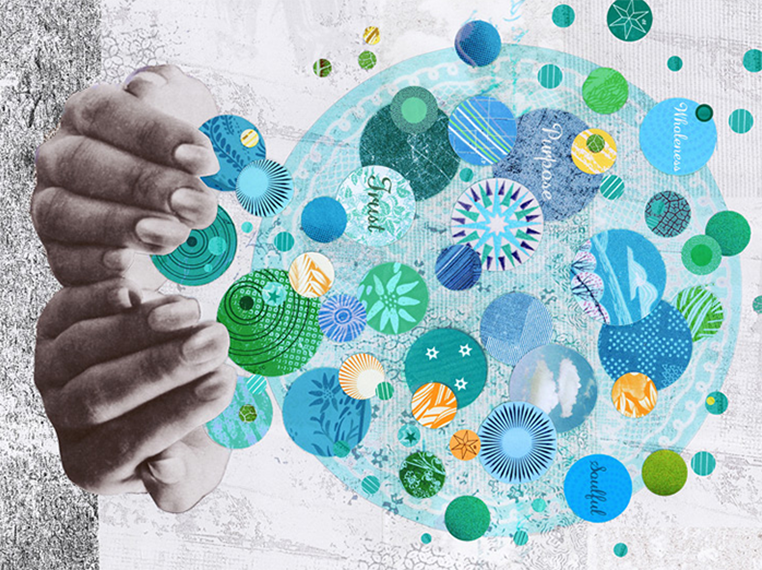 Specific organisations that the author identified in his research as being teal are ESBZ, FAVI, Heiligenfeld, Morning Star, Patagonia, Resources for Human Development, Buurzorg, Sounds True, Sun Hydraulics and Holacracy. These companies all had very similar approaches to their management and leadership, leading to the emergence of the idea of teal organisations. What Are The Characteristics of Teal? It is helpful to better understand the characteristics of teal. Self management is one of the primary factors of teal. Self management is based around peer relationships. People are argued to have high autonomy in their area of expertise and they are required to coordinate with others. Power is not linked to position as in former organisational types. 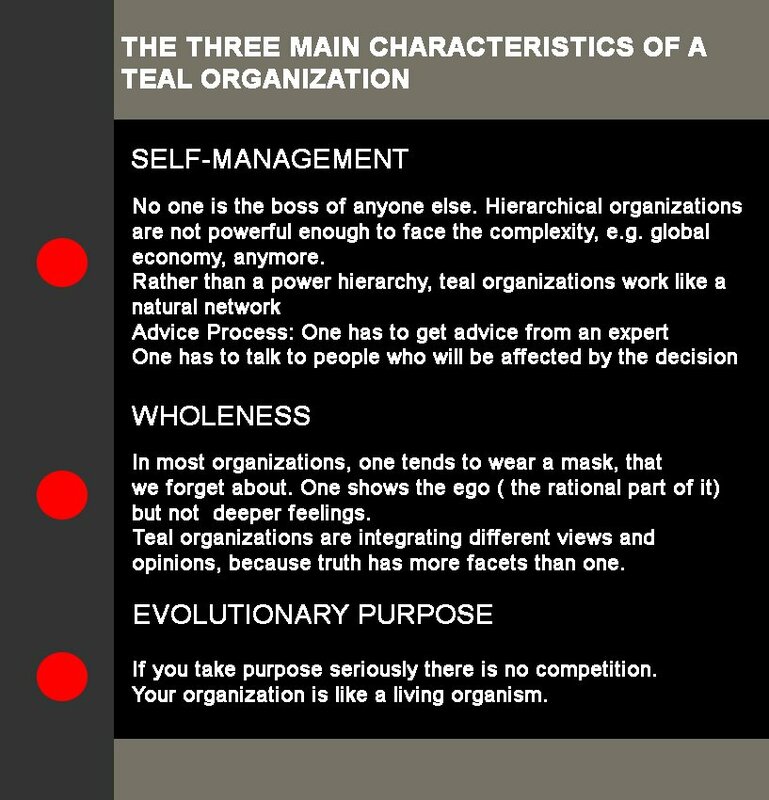 Wholeness is also an important feature of teal organisations. It is explained that while in orange and green organisations people are expected to present only their professional self in the office, teal companies encourage greater wholeness where people have an opportunity to present themselves fully. This is thought to encourage greater creativity, passion and energy. These organisations also have an “evolutionary purpose”. This is described to be a strategy based on what they think is needed in the world – they focus on other areas than financial results, and in doing so are able to outshine their competitors in this regard. There are two requirements that need to be in place for a teal organisation to be able to develop. One is top leadership. The top leadership has to have a mind set that is compatible with the ideals of teal. This is considered to be an “integrated worldview”. The second requirement is that the owners of the business also share the ideals of teal. It has been seen that if board members do not really understand what teal is, initially they might go along with it, but ultimately if the organisation hits harder times then owners will want to instil top down authority back into that business. For those that are able to create a teal organisation the rewards are plentiful. It is argued that such organisations may grow quickly but people are able to get on with their work in a simple way. There is a lower need for management to have to try and keep control of everything, because people are more autonomous and empowered to do what needs to be done. People control themselves by being accountable for their actions. It can only be hoped that more organisations and businesses move to a teal format, and soon.